After many years of waiting, Google's online storage service will finally be available. It won't be called GDrive, as it will only be an updated version of Google Docs. "Instead of emailing files to yourself, which is particularly difficult with large files, you can upload to Google Docs any file up to 250 MB. You'll have 1 GB of free storage for files you don't convert into one of the Google Docs formats (i.e. Google documents, spreadsheets, and presentations), and if you need more space, you can buy additional storage for $0.25 per GB per year," mentions Google Docs blog. The update will be slowly rolled out in the coming days and it's the next step in the evolution of Google's online office suite. 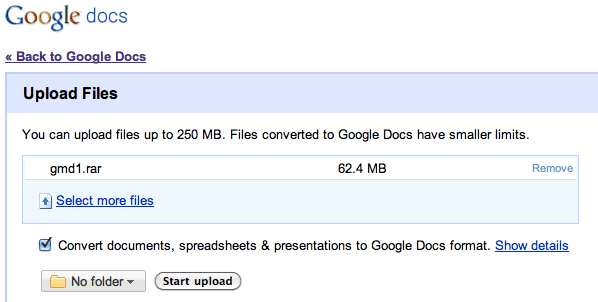 When Google added support for PDF files in 2008, it became clear that Google Docs will let you upload any kind of file. Google says that the service will be able to open many common file formats. "You can search for document files you've uploaded or that have been shared with you just like you do with your Google documents, spreadsheets, presentations, and PDFs. And you'll be able to view many common document file types with the Google Docs viewer." Google Docs has the potential to become a great service for online storage, but it won't succeed if it only includes 1 GB of free storage. Microsoft's SkyDrive offers 25 GB of free storage, while ADrive offers 50 GB of free storage. Even Gmail has more free storage than Google Docs and its main purpose is not storing files. It's not Gdrive. Gdrive doesn't exist, google says. Yes, 1GB won't cut it. Also, on Google Enterprise blog, they say $3.50/gb/year for Google Apps customers, elsewhere they say $0.25/gb/year. 3.50/gb is expensive. 1GB? ONE GIGABYTE? Let's compare with 25GB from Windows Live SkyDrive. Any other questions? We need synchronization to be able to speak of it as a 'drive'. They will add to the storage, soon (with no cost). No doubt. They like to go step by step. If 0.25 GB is true, then it is a great offer. i like it. I think it's 0,25$/Go/year because extension storage for online picasa pictures or other files begins at 5$/year for 20Go. It's $0.25/GB per year, yes, but right now the minimum you can add is 20GB ($5.00/year). Still a good deal, but I think they omitted that minimum. Who knows, maybe they will change the storage pricing options over the next couple of weeks so that you can order by the GB needed. I would still like to see the storage space consolidated, unified and accessible over all their products - Gmail, Picasa, Docs. Its still limiting and more complicated then it needs to be right now. I'm guessing the unified concept will materialize once Chrome OS is released. No size display on the "All Items". Seriously... what do you people have against displaying sizes? It's still not in gmail either. Finaly!!!! I knew 2010 would be the year! Thank you Google, now you are trully the best!!! Cloud Hero (cloudhero.com) uploads, downloads and syncs files to Google Docs. We will update for all file types. It has finally arrived and it is quite a disappointment. So glad Dropbox didn't get intimidated and not release. I think we all would like to synchronise our data between PC and Gdrive servers. This could be so powerful !! I tried to upload an Mp3 and WMV file and those are not yet ready for upload. So this isn't quite what I am looking for yet, but will watch with excitement now that I have drank the Google Kool-aid. Google needs to acquire Dropbox........NOW! I want some desktop syncing Google! So, we are going to see the storage part of the Google Operating System? I think the important thing will be the interface with personal storage and how that is managed. The problem with SkyDrive is the horribly clunky web interface and directory structure limitations. There needs to be a way the file explorer to mount the storage space like it belongs in the clients directory structure (for example how Konqueror mounts networked/internet storage in sftp or a similar protocol). I want to manage my files in one location, have them synchronized between locations, and available online and off. I think in order for GDrive to be wildly successful it's going to need to overcome those hurdles. If it doesn't it will end up like SkyDrive and the like. I like SkyDrive and do use it for various things...but I do agree with Randy that it's extremely "clunky". The 25GB is almost not worth the hassle. SkyDrive's individual file limit is 50MB. I mean, c'mon. Sup with individual file limits, in both gDocs and SkyDrive? 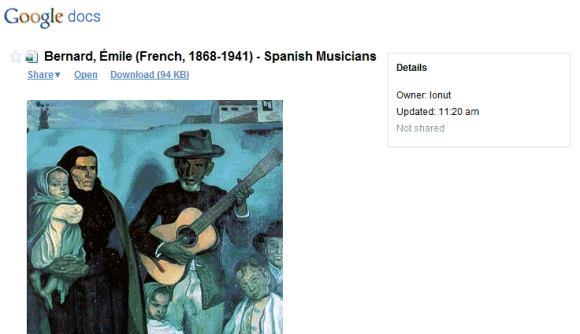 Since Google allow docs file sharing I use Google Docs for file storage of my website. For other files I use Dropbox. Sure, Google should acquire Dropbox ! Awesome...Thats so perfect. Finally we can have this application. I bought into this, getting 200gb for backing up photos.. this isn't ready for primetime yet. You have to go through Picasa to upload them to a gallery. Fine. But it wants to take my RAW files (.CR2) and convert them all to JPG's. Umm no thanks! Maybe the web interface will let me do it after their "slow" roll-out. Cloudhero looked promising but it is PC only. At least my free eye-fi is worth more than the cost of the service. 1 GB is misleading as any PDF, docs, spreadsheets, or presentations will not count against it. Actually, only the documents, spreadsheets and presentations converted to Google Docs aren't added to the 1 GB quota. For example, if you upload 4000 documents x 500 KB, 1000 presentations x 10 MB and 1000 spreadsheets x 1 MB, you'll use 13 GB. Personally I use a lot of excel files with macros. So for now I don't use much google docs (no macro inside!) beside reading in gmail : html, pdf and ppt files. For my backup I am using Elephant drive Home plus edition (I am using their ElephantDesktop software). So for 99$/year I can save 4 of my computers hard drives with unlimited space (2GB max size for files). I have about 350Go saved for now. And I am happy about it. ;) I can make searches for filenames in my backup archives. But the only caveat for now is that I still cannot use it with keywords searches ala "Google Desktop Search". Is there any Firefox extension to synchronize GDrive with our desktop now please ? I think SugarSync has the market on Sync... they, in my opinion, are the only ones that got it right. I have 2 PC's with selected folders sync'd across both, some only to the cloud, and some stuff only in the cloud. The only issue is they are expensive, so if Google decided to implement such a feature, I surely would have to jump over. But only if it's done right. Like many other Sync sites, if I have to copy files to G: or X: or whatever it's called, then in my opinion it's not right. I think picking existing folders in their existing location and syncing them is awesome. Doesnt work for me. I uploaded a mp3 and once the upload completed it said "I'm sorry mp3 files are not supported". That's because your account hasn't been updated. As mentioned in the post, all Google accounts will be updated in the coming days. Oh, and I'm a Google Apps for Your Domain user. Were treated as the red headed step child. "Users of the stand-alone Docs suite will have 1GB of free storage for files stored in their native formats, as opposed to converted to a native Docs format. They'll be able to buy additional storage for $0.25 per gigabyte per year. Google Apps users will also get 1GB of storage, and will have the ability to buy additional storage for $3.50 per gigabyte per year." Again the apps user gets abused again. Microsoft SkyDive works great for me. 25GB is more than plenty. It also works with all the Live app solutions. I think Google is starting off with 1GB to test the waters. You can't take too many risky steps at the company's current size, or you'll wreck the company image. The 250 GB limit per file is what makes it unusable for me. I need unlimited files size and 1 TB space to backup all my iTunes movies. Carbonite or Dropbox won't do that either cause they only backup or sync what is currently on your pc and I hold most of my files on a external backup drive. The limit is 250 MB/file, not 250 GB/file and it's pretty reasonable. SkyDrive's limit is 50 MB/file, but you get 25 GB of storage for free. Uploading files of any type: "Note: This feature is only available to Google Apps Premier domains." I've been using g.ho.st for my backup files and Microsoft SkyDrive ... But, this is good news for me since I'm a Googler! Love it, can't want to try it! At least it will probably have better support than gdrive.net which gives no support at all. I think Gdrive storage capasity should be higher than it's comparative online storage service providers. I think Gdrive capasity should be Grater than it's compititors. Like Adrive etc. Atleast Gdrive Capasity minimum 100 GB. No doubt 1 GB has got to be a joke, I am currently using a website called SaveYourWork.com, and it's just run by some students at my university. I'm pretty sure they have hardly any budget and they offer 1 GB free, plus it's a way more fun app to use than google. If I'm going to pay, it's going to go students, not the trillion dollar empire that is Google. 1GB is enough for my personal important file backups, I love it even more since it is bundled from gmail and docs (not an outside app), it is like all-in-one, Just what I've neede. If I want larger storage, I'll just sign up at other providers. Google has no match with Dropbox or Ubuntu One. Both works on Linux and Windows. Ubuntu One syncs everything from browser favourites etc... I think that Ubuntu One will be the winner in this game. Microsoft SkyDrive is Windows only and non-secure spagetti cloud. Without Gladinet, then yes, it is not worth the hassle. However, with Gladinet's streamlined interface right on your Desktop, it eliminate the hassle of relying on a cumbersome SkyDrive web interface. Gladinet makes Skydrive a lot more convenient and easier to use. I can't say I share your sentiments. Dropbox's free offering (2.25 gb) is paltry compared to its competitors, like SkyDrive and Adrive, for example. The part about non-secure spagetti cloud is incorrect. SkyDrive "is" secure. Here is the excerpt from this website: How are Data on Skydrive protected on the Storage - is there any encryption in use? Microsoft takes several steps to help protect your data. For example, when you upload or access private files on SkyDrive, we encrypt information sent between you and our servers using Secure Sockets Layer (SSL) to help prevent eavesdroppers from seeing your files when in transit. Once your files are on our servers, we work to prevent hackers from accessing your data by employing sophisticated physical and electronic security measures. We also store multiple copies of your file on different servers and hard drives to help protect your data from hardware failure. skydrive has so man limitation and see the note: when you upload the docs it says MS can put a limit on monthly uploads to a client ( means even if you are using 10 MB but 100 files thats it you can use , the button in live accoutn ( add files ) allow only one file at a time. cannt they change it to add file instead.